Discover one of the most traditional areas of Normandy ! Daily from May to September and on request only from October to April. Student: with a student card and under 26. Child: under 10 years old. Included: transportation, cider/cheese tasting and explanations of the guide at the different stops. All departures from Bayeux (pick-up at place du Quebec, train station, or your hotel on request). Price of lunch not included (1 hour stop for lunch). When the French people from other regions think of Normandy, the first image that comes to their mind is a group of dairy cows, in an apple trees orchard, next to a half-timbered house with a thatched roof. This tour we are offering you will take you to discover the Pays d'Auge area, one of the most traditional ones of our region. We will take you, through beautiful countryside with rolling hills and picturesque villages, to visit a local producer who will share with us some Normandy cheeses and delicious apple cider, pommeau and calvados brandy, and also explain some of the secrets of their production. Nevertheless, our first stop will be on the Cote Fleurie coast to visit the little fishing villages that had once attracted the impressionist painters. They have since become famous and fancy beach communities, such as Deauville and Trouville. Gorgeous villas are lined up overlooking the fine sand beach and the salty air is invigorating. Well visited sites they are also well equipped with horse race tracks, golf course, gambling casinos, art galleries and permanently animated by special events. Along the Cote de Grace coast and the mouth of the river Seine, the changing light and natural beauty will impress you and touch you. 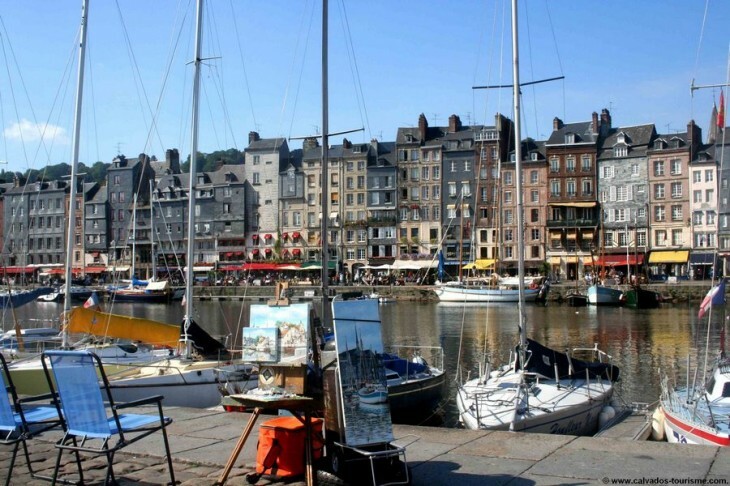 Best location is Honfleur, for us to be in a place where time seems to have stopped several centuries ago. Incredibly varied architecture will take you right into Middle Ages, with the remains of its fortifications and the extraordinary St Catherine church. Renaissance style is also there, as the 16th century was a prosperous time here, leading to Champlain's departure in 1608 and the foundation of Quebec City. Modern times were also a booming time when the village became an artist colony where Monet and his painter friends used to meet here around the St Simeon Farm. Back on the countryside roads, between hedgerows surrounding pastures, we will discover more of the hinterland, with its hills covered by apple trees. Following winding roads, we will pass by many horse farms, manor houses and farm houses, built of stone or commonly half-timbered. It is now time to finally stop in the most picturesque village of Beuvron-en-Auge.